I was born in Colonia Juarez, Chihuahua, Mexico on March 22, 1916. I'm told that the wind was blowing hard that day. In fact, at one point my father called me "Windy," but I think that it was because I talked too much. When he called me that I would retort, "Well, I take after my daddy!" My dad was the most honest, trustworthy, likable man that I ever knew; to him right was right and wrong was wrong. He was very strict about the Sabbath day and insisted that we keep it holy. He did have one bad habit—he cussed every other word. My dad and Orson Hawkins would have contests to see who could pull the worst faces. Dad could screw up his whole face and mouth and make the funniest faces so he always won. I don't remember my mother. [She died when Nelle was only 5 years old.] Sister Agnes Hawkins who was her good friend would tell me about her: her long black hair and her singing ability. I do remember when she died and was laid out in our living room in front of a big window. We lived in Colonia Juarez across the street from my MacDonald grandparents. After school we would go over to their house to get cookies or candy. Grandma wanted to keep chickens so my dad made her some little houses for the chickens. When the chickens were gone we used them for playhouses. We sure had to clean them out good because they were really messy. My best friend Ella Romney and I would play house out there all day. Grandma Mac made candy for a living for years and years. She made fondant in chocolate, pink, and white and then put it together and sliced it. She sold it to the stores and everyone would buy it even though she gave a lot of it away. Sometimes I would go ask Dad if I could have a new dress. He would tell me to go down to the Farnsworth-Romney store and get some material and charge it. Then we would take the fabric to Sister Jorgenson, a hunch-backed lady who was the town seamstress. She had a big catalog that had all the pictures of dresses and we would pick out which dress we wanted and she would make it. She made all our school dresses, Hannah's and mine. We never wore pants; we always wore dresses to school; we each had three or four dresses so we did well. Sam Camphouse raised sugar cane. He would extract the juice, put it in a big vat over a fire, and stir it until it turned into molasses. We children would go out and ask for cane to eat and he would tell us to take all we wanted. When our dad found out about it, he told us not to take any more cane because that was Brother Camphouse's means of support. One day Hannah and I came with our arms full of cane. There came Dad on his big old mule. He asked, "Where did you get the cane?" "From Brother Camphouse." "Did you pay for it?" "No." We got a whipping that day, the only one I remember getting from my dad. It was a good one because it lasted all those years. My dad was funny, though. Whenever he got after us, some time later we would find a twenty-cent piece under our pillow. Sister Camphouse was my Bluebird Primary teacher; she was such a good teacher. That's when there were bluebirds, larks, and seagulls. [These were the names of the Primary classes.] She taught us how to crochet and knit. We went to Church in the old, round schoolhouse on the flat. Parents would go to Church but leave their children home; the older children would tend the younger ones. One Sunday I went up to the Bowmans to help Dorothy tend her little brothers. It was during this time that little Jessie Cardon found a gun, pointed it at his brother, and killed him. It was devastating for everyone. I later worked with Sister Cardon in the mutual and grew to love her. For Christmas when I was little, we would have a plate just like the plates we eat on and it would have an orange, a popcorn ball, and some of Grandma's candy. We didn't have stockings, just a plate. I remember once Dad went to Chihuahua and brought us some little porcelain dolls. It had a little painted face but no real hair—it was just painted on. I remember the clothes that came with it and the doll was in a little basket. I thought that it was the prettiest thing I had ever seen in my life. One Christmas I snooped and Grandma found it out and she said, "Nelle, I'm afraid you're not going to get much for Christmas since you've been snooping around and looking around." Oh, I cried and felt so bad and told her I'd never do it again. And I never did. That was the Christmas I got a big doll that had orange hair and legs that moved. It was really ugly, but I thought it was the most beautiful doll in the whole world. I would brush her hair and comb it so much. We would go over to the Church on Christmas Eve and sing Christmas carols and then one of the bishopric would come in and say, "I think I hear Santa; I think I heard little feet up on the roof." We would all clap and get so excited and then finally "Ho, ho, ho" Santa would come in on the stage and he would have this big sack on his back that was full of oranges and popcorn balls and little sacks of candy. He would give us all some; that was the most delightful thing. The Boy Scouts would get in big old trucks and go up to the mountains by Garcia or Chiuchupa and cut down lots of Christmas trees. They would take them to the Church house and we would all go by and pick one. To decorate them we would string popcorn into long white chains. Then Dad would buy oranges and we would get a long threaded needle and we would thread it through the oranges and hang them on the tree. Later we would eat the oranges. We would also put little candles on the tree and light them. Hannah and I would go out early to school and teeter-totter. Once Hannah decided to jump off. I was on my stomach on the teeter-totter board, so when I came down hard it knocked me out. Hannah thought I was dead. I woke up and she was just screaming and crying. It really did hurt. We learned our lesson not to jump off. We had this big iron swing that would go way up. One day we were swinging and little Ruth Farnsworth got in the way and the swing hit her right in the head. She died three days later. They took the swings down after that because they were too dangerous. They also made the teeter-totter smaller. Out by the school was this big pit. We made little paths all around in it and we would run around it. Sometimes we'd fall, but most of the time we would just run around all recess. We would run home and eat lunch as fast as we could so we could come back and play. Aunt Lucille Taylor was my teacher for the first and second grades. We had a little old room down in the basement that was so cold. But she was a good teacher. I had never seen in airplane, only pictures of them. One day we heard this plane and the whole eighth grade got up and left and ran down where the plane lit. It was quite exciting. Sister Pratt kept yelling at us to come back, but we wanted to see that plane more than anything. My best friend was Ella Romney (Miller). We lived just across the street from each other; we were always together. Her older brother worked down in the Farnsworth-Romney Store and was so cute. He would drive around in his Dad's car and we'd just beg for him to take us with him. And he would say, "If you'll stay here and not fuss I'll give you some money." So he would give us each a big 20-cent piece, which was a lot of money for us. We had this little pinto horse; when LaSelle rode him it seemed like his feet touched the ground. [LaSelle was Nelle's brother.] Dad would let us ride him around. Dad also had a great big horse. We didn't ride him; he was too big. I was real good friends with John Carlton. I ate at their house almost every Sunday, more than I did at home. His mother was such a good cook; I would go out there on the flat and just feast. His older brother Leo went with Hannah and I went with John. Uncle Harvey Taylor owned a place up on the way to Juarez that they called the Riquena. Lynn Taylor, who was dating Ella, and John and I would go to get the milk. On our way up we would stop and buy these yummy round "paletas" [popsicles]. Nelle "batched" during 3 ½ years of high school. That means she left home and lived in Colonia Juarez in order to attend the Juarez Stake Academy. She lived on her own with some other girls, doing their own cooking, laundry, etc. She didn't get to go home to Dublan very often because it cost 90 cents and she didn't have it that kind of money. 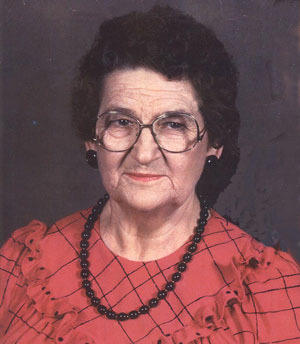 Over the years she lived in three different places: in Sister Millie Whetten's house in two rooms, upstairs on one side of the Bentley's home (the old Ivins home), and in Grandma Hatch's house. She lived with Ella Romney, Flossie Bluth, and for a time with her sister Hannah Vee and some other girls. While living in the Whetten home, Nelle was sometimes frustrated because she felt that her Aunt Maud (Taylor Bentley) wouldn't share the produce from her large garden or the fruit from their fruit trees. So one day the girls decided they would get the apples another way. The apples were stored in boxes in a little shed by the house, so the girls got the apples out of the boxes one by one through a hole in the slats of the shed. Nelle's Aunt Rinda (Taylor Abegg) in Dublan would send wonderful cinnamon rolls and sweets up to the girls with her husband Moroni. Aunt Lillian, (Nelle's stepmother Lillian Hatch Taylor) would also send bread up to the girls, two or three loaves at a time wrapped in a flour sack. "She saved our lives," Nelle said, "Sometimes that's all we had to eat." Sister Romney would give them fruit that she had put up for them to eat with their bread. While living at the Bentley's home, the Clarks lived on the other side and they still had outside plumbing. Nelle remembers: "Every time we went to the outside toilet laughing and talking on the way, Brother Clark would always be in there. He would say 'You'll have to come back in a while' so we would go back and do something else and then go back in a while." The Clarks had a big hound dog that lived with them. No matter how they put their food away, even tying it up in something, that dog would get into it and eat it. So one day Nelle had had it! She got a big stick and went into the Clark's side of the house to get that dog. "You're going to get it now!" she was going to yell. But just as she came around the corner there was Brother Clark coming up the stairs. So she changed her tone quickly, "Okay, doggie, here, you can have some bread." Before she left the academy she truly wanted something to happen to that dog! Nelle lived upstairs with the girls and two boys lived downstairs on one side. One day Verla came home and when she turned down her bed, some of the boys including her brother, had put egg shells all over her pillow. Nelle said, "They were always pulling stunts on us." One day Verla got so mad at one of the boys that she threw a bucket of water at one of the boys and it went right down the stairs into the Bentley's living room onto the beautiful rug. Brother Bentley was going to kick her out, but Hannah coaxed him into letting her stay. During her years at Juarez Stake Academy, Nelle had some special friends; they were sort of like the five musketeers. The group was Nelle, Ella Romney (Miller), Nellie Spilsbury (Romney), Elois Cardon, and Ivis Farnsworth. They talked and played and had a lot of fun. "We had more fun than anyone in the school!" Nelle commented. There were some special boys, too. Herman Hatch and Ralph Sloan, whom they called "Molly" but Nelle doesn't remember why, would always sneak up and peek on any couple who were having a date. Nelle explained, "They would come and tell us all about it and they never got caught either." They especially liked to peek on A. Maud and Miles Romney when they'd come home from play practice. Nelle and the other girls (when they lived with Grandma Hatch) had to cross the long swinging bridge that spanned the river. It was made of wood with just some chicken wire on the sides. Greer Skousen and Molly Sloan always knew when they were going across the bridge and they would get on either end of the bridge and start swinging it as hard as they could. Nelle said: "It would scare us to death and of course that just made them do it worse. I would say, 'I'm going to kill you, Greer Skousen.' and he would answer 'No, you're not; you know you like it.' But I was really scared; sometimes I would even start to cry I was so scared!" During her sophomore year Nelle had a big crush on Bob Bowman (brother of her future husband). They dated and mostly they went to dances because "that's one thing he could do, dance!" But he had to play his violin with Sister Viva Bluth on the piano since that's all the music they had. She would tell him he was "married to his violin" because he would only dance with her for the first dance, one in the middle and one at the end. But Nelle danced with everyone so it was okay. She says that their relationship was like "an old sock: on, off." Nelle recalls that Mr. Clark was one of her teachers at the academy and once gave her a D in Algebra. "It was a horrible class," she said, "That's why I talked all the time. He thought he was so witty and he'd tell jokes so we would tickle ourselves and laugh." So she went to talk to him and told him that it wasn't fair that he gave her a D for deportment and not for her work. She said to him, "I can't help it [talking]; it's in my genes." But her work really was good so he changed it to a B. Nelle despised math but was good in English and writing, so sometimes one of her friends would do Nelle's math and Nelle would do her English. One day when Nelle was 16 or 17 she got a letter from Brother Ara Call telling her she had been nominated the "Queen of the May." This was a great privilege since it was also a celebration of the Mexican Cinco de Mayo, but Nelle protested that she couldn't be Queen of the May for the Dublan Ward because she was a member of the Juarez Ward and besides, she didn't have anything to wear. But Brother Call insisted so she was. She remembers that her stepmother Aunt Lillian said that "Nelle was going to have a dress no matter what" and she made a dress using a pale green organdy material with little pink roses. It had little straps and puffy sleeves and was long and full. It was the most beautiful dress Nelle had ever seen. And Nelle never knew where Aunt Lillian got the cloth or how they afforded it. Aunt Lillian also made her a big, broad-rimmed hat, all lined. In her later years while looking at the picture of herself with her attendants (whom she had chosen) she said, "I was thin once and that's proof!" There was a big dance and a special ceremony to introduce the queen and her attendants who were then crowned. During her senior year at Juarez Stake Academy, Nelle was vice-president of the student body. Ashton Longhurst was president even though Nelle really wanted Bob Bowman to be president. They had a lot of fun activities including a program nearly every Friday with musical numbers and skits they had written and dances and parties. Sister Viva Bluth (who was named Viva because she was born on Mexican Independence Day; Viva Mexico!) helped them with these programs. She was Nelle's favorite teacher; she taught them music and how to dance. Every year they would put on an opera and everyone who wanted to could be in it. Nelle commented, "I never got a speaking part and that's what I was the best at, but I was good enough to hobble around in the dances." Another of the highlights of high school according to Nelle was the rock fights ("I nearly got killed!" she said) and water fights. They broke out all the time. Also the young people were always making candy and dances were a very big thing; they had them every other week or so. Once when Nelle was living at Grandma Hatch's house she and the other girls had hung their laundry out on the clothesline to dry. Along came Harold Brown and told Nelle, "If you had a red flannel petticoat you would have the Mexican flag." She told him to shut up. But it was true because hanging on the line was their green and white underwear. (The colors of the Mexican flag are red, white, and green). Soon after that Nelle started dating Harold. They even went on a trip with another couple clear up to Chuichupa (another colony) for three days. Nelle doesn't remember exactly what they did, but they had a great time hiking, visiting the Black Canyon, eating good food, and sitting around big bonfires. One thing she remembers is the problem of going to the bathroom out in the middle of the mountains. She also can't believe her father let her go, but he did. Nelle graduated from the Juarez Stake Academy with the class of 1935. When I was about 18 Brother Keeler, the Superintendent of Schools, called me in and said he would like me to teach school, only he wanted me to teach in Colonia Juarez. I agreed to and taught either second or third grade. I lived with one of Miles Romney's wives, Francis (he had four). It was really fun. One of my students was little David Jewel. The principal warned me that he was terrible, he kicked his teachers, and that if he got too bad I could get a little switch and spank his bottom. He had a big, black, blind dog that he would bring to school every day. The dog would sit right in front of my blackboard so I would have to stumble over that dog every time I did something on the board, and sometimes it would wander all over the room and distract the kids. I finally told David that the dog had to go. He had all kinds of excuses like "He is such a good friend of mine; he would get so lonely", but I insisted. One day David got mad and threw his books all over the room. I said, "David, go pick up your books." He said, "I won't do it and you can't make me." I thought, "Oh boy, this is it." I took him into the little room by my schoolroom and turned him over my knee and spanked him. He let out these loud screams that the principal heard, so he came down. I just told him that David and I were having a little trouble here, but we'd be all right. David picked up his books and after that we became really good friends. He would come by and pick me up and we would go to school together. One day David came in and said, "Miss Taylor, you'd better keep your eyes open." And I said, "Why? "� And he said, "Because you can't see with them shut!" In some ways he was really cute. One day school started and I couldn't find David. When I asked the other students, they said he was down on the river bottom smoking with Marion Wood. I excused myself and went down to the river and there they were. I told them they had to go to school and brought them back. He was smart as a whip. I always have wondered what happened to him; they moved to the states. One summer Nelle worked at Jacob Lake, Arizona, a resort in the pines run by the Harold Bowman family. She was a cook and would make big loaves of bread and lots of pies. Because they weren't allowed to eat the pies, once Nelle burned one on purpose so they could eat it. The sink in the kitchen leaked so when people would ask where Jacob Lake was, Nelle would say that it was here under the sink. "That would make Aunt Nina so mad!" she commented. They had to work hard but always managed to find some fun. At least twice, a group of girls sneaked out and walked down to the bus stop area, put on some music, and danced around for a while. Then they had to sneak back into their cabins without Aunt Nina catching them. Nelle and her older sister Hannah left home in the fall 1937 to go to Salt Lake City, Utah, to work. She worked for a Mr. and Mrs. Sheets for $10 a week, which was a lot of money then. She did housework and cooking. Her sister Hannah worked in a home just a few doors down, so they did a lot together. Every Thursday was their day off and they would get all dressed up and go downtown. All dressed up meant nice dress, gloves, nice shoes and stockings, and a cute coat. They would go to shows (movies), have a nice dinner, and stay out until 10:30 or 11:00 pm. They loved that day off. One of the first things Nelle bought with her own money was a little black coat. The family had a three-year-old daughter who liked Nelle more than her mother and wanted Nelle to do everything for her. She would follow her around and hang on her dress all day. She cried when Nelle left because she wanted to go with her. One day her employer's old father got fresh and made a pass at Nelle. She left there very quickly saying, "I would rather starve to death than work there." She left Salt Lake and moved to Provo in January 1938, finding an apartment after a couple of days staying with friends. She registered at Brigham Young Academy for the winter term, taking such classes as English, bacteriology (about which she said, "I can say I'm not crazy about the class as a whole"), social dance (where there were so many boys), geology, religious education, typing, and home administration, which included topics such as "Food Problems in the Home." She also took gym where she played basketball and was quite the player. In one game, she says she made 10 points out of 11. Nelle was a member of a sorority called "Alta Mitra" where she helped plan and carry out many fun activities and dances. She was in charge of one activity for the Cinco de Mayo when she and some other kids from the colonies danced a medley of Mexican dances. She was also in charge of the food and it was so popular they didn't have enough for everyone. There were many fun activities including going to the movies every Sunday afternoon. Nelle had many friends who were always dropping by to chat. For the second semester Nelle had to get a loan in order to continue her schooling. In order to pay back the loan, she had to work. She worked cleaning house, in the bindery, and in the library off and on. During one stretch of school, Nelle's uncle Harvey Taylor sent her $4 a week. Later she tried to pay it back but he wouldn't let her. Sometimes money was pretty tight. At one point Nelle couldn't afford to buy new shoes, so when the soles of her shoes wore out she had to cut pieces of cardboard to put in the bottom. That was not much fun for walking on icy sidewalks. One day while at school she got a check from home for ten dollars. In her words: "What a lifesaver!" Claudius would take turns going with three girls: Nelle, LaPrele Bluth, and Estell Shupe. They would say among themselves, "Well, it is almost my turn" or "It seems like it's my turn." Then all of a sudden he dropped the other two girls and went with Nelle steadily. She recalls, "He wore a white shirt, pale blue slacks, and white shoes when he came courting. He was so handsome!" But it was sometimes hard to get him to have a good time; he always said he had a hard time socializing. According to Claudius, "By this time (1941) Nelle had become so desperate that she accepted the attentions of a chicken man and married him before the school could get her." Claudius at the time was managing a poultry business. During the summer of 1941 Nelle spent most of her time with Claudius and making and shopping for items for her trousseau. For a week in July 1941 Nelle and Claudius spent a week with some other couples in the mountains camping out. They visited Pacheco and Cave Valley and even had their pictures taken peeking out of a huge olla. Nelle and Claudius were married on September 18, 1941, in the Mesa Arizona Temple. They were accompanied by Claudius' parents, his sister Dorothy, and Nelle's father Loren Taylor. Some of the Mexico people living in Arizona threw a party for them and they received a few gifts, including some money. They also had a reception in Dublan when they got home. The newlyweds lived for a few weeks with Mother and Dad Bowman and then purchased a small house across the street from the Bowman home. Claudius was very handy and did a lot of fixing up, including painting and putting in a bathroom and a kitchen sink. They bought a little refrigerator from Uncle Moroni Abegg and got a coal-oil stove and brought some mattresses in from El Paso, which made up a bed in the living room area. All of the children were born there in that bed. Nelle had difficulty having children; she had more than two or three miscarriages. Doctor Hatch had a doctor friend who came to hunt and also to examine Nelle. He gave her some pills and told her he would be up next year for the christening. Sure enough Nelle had her first baby, a son on October 22, 1945, who they named Claudius Bowman III. The chicken business being what it was, Nelle resumed teaching school in the Dublan School, leaving her year old baby with the hired girl. Later she conducted a kindergarten in her home so she could be there. Later after her fifth and last child was five years old in 1958, she started teaching again and taught for more than 20 years. The other children to come to the family were: Jennie Loriene born on December 22, 1947; Flora Eileen born July 18, 1950; Roberta born September 4, 1951; and Conrad LeRoy born October 16, 1953. Church service took much of Nelle's time and talents and profited from many hours of insomnia, usually from 3:00 to 5:00 am when she came up with a lot of her ideas. Every job she had in the Church got the full measure of her intense energy and creativity. Some of the jobs she had included president of the YWMIA, stake gleaner supervisor, Sunday School teacher, Primary teacher, junior Sunday school coordinator, counselor in ward Primary and stake Primary, and stake Primary president for 8 years. In April 1958 Nelle made arrangements for the whole Primary board to travel to Utah to attend the meetings and workshops that were held at general conference time. They earned the money to go by doing fundraisers, one of which was catering a banquet for the basketball champions. The board members traveled in cars and stayed in the Hotel Utah. At the president's dinner Nelle received a gold cup for the Juarez Stake, awarded for their work in the Children's Friend campaign; she also received a beautiful lavender orchid. It was a very memorable experience. Nelle wrote in her journal on August 29, 1958: "This is the day I came into the money from Aunt Lucy Van Cott. She didn't leave a will so her money was divided among all her relatives. Laselle, Hannah, and I got $107.75. I guess we'll use it to go to Elwood's wedding in California." In about 1960 Claudius inherited some land out on the flat from his mother, so he decided to go into the orchard business. Nelle records, "It was a real thrill for us when we started to get the land ready for our orchard out on the flat. We have planted peach, pear, and apple trees." Around this same time Nelle realized her dream of having her home remodeled completely. They took off the screen porch and added four bedrooms and two bathrooms. They enlarged the kitchen, added a pantry and laundry room, installed a furnace for central heating, and made a basement room under the kitchen. The work was done by Claudius' brother, Donn, who did a beautiful job. During part of the remodeling the family lived with Grandma Bowman, with some of the children sleeping at Donn and Maurine Bowman's house. Nelle continued to teach school at Dublan Elementary. In 1962 a new school building was constructed and it was nice to have a beautiful, modern school. For the next few years Nelle was busy with school, children, and Church work, including a stint as Mrs. Bishop when Claudius was called to be bishop of the Dublan 2nd Ward (Spanish speaking). As her children grew up, left home to go to school, married, and began having their own children, Nelle traveled a lot out to the states (mostly Arizona, Utah, and California) to visit. She especially enjoyed going to help out when a new baby came. Most of the trips were long drives in the car, but on occasion she flew in airplanes (and was terrified the whole time). We love our Sister Nelle, let us tell you why. We love our Sister Nelle and that's one reason why. she shows appreciation, And does it so well. Nelle is so very clever, full of wisdom and wit. We appreciate her humor and enjoy every bit. Nelle's a friend to little children, little children, little children. Nelle's a friend to little children, their teacher as well. And so we're all more friendly when Nelle is around. She's a very good example, example, example. She's a very good example, We'll follow her way. The more we learn from Nelle, happier families we'll be. We'll share our Sister Nelle, Sister Nelle, Sister Nelle. We'll share our Sister Nelle, with our sisters down south. With all her talents, others too, she will bless. Nelle recorded that she was quite embarrassed but at the same time thrilled. The missionary farewell sacrament meeting was held on April 23 and Nelle, Claudius, and the Bowman family did the program. Their daughter Nina and son Claudius and his family were able to come to Dublan to take part in singing, giving talks, and playing the piano. Music was also furnished by the Dublan Ward Choir and the Bowman brothers. Later that day Claudius gave Nelle a patriarchal blessing, which for some reason she didn't get one earlier in her life, and it was very special for her. They were set apart as missionaries on April 26, 1978, by Juarez stake president Waldo P. Call and promised many great and wonderful blessings, including the blessing of good health and that they would be protected as if surrounded by a band of steel around them. From April 30 to May 10 Nelle and Claudius traveled to visit their children and grandchildren. They visited Claudius and family in El Paso, Texas, the Jensens in Dodge City, Kansas, and the Esmeyers in Salt Lake City, Utah. During the trip to Utah President Call's blessing was fulfilled as they traveled through Wyoming. The weather turned very bad with snow and icy roads. On a curve in a mountain pass, the car hit black ice and slipped sideways. Claudius thought maybe they were going to roll over, but something whirled the car completely around and it went off the bank backwards. If this had happened just a few feet earlier, they would have gone down a steep embankment. They didn't even get out of the car but drove back onto the highway and continued their journey. During their stay in Salt Lake they visited relatives, purchased enough clothing to last two years, installed air conditioning in their Rambler car, and went to see the movie Star Wars with their Esmeyer grandchildren. Being at the Language Training Mission was a wonderful, spiritual experience, but on the second day there, Nelle forgot one very important rule: "You must always stay with your companion." She did feel like having breakfast, so she told Claudius to go without her. He was back before too long and reminded her that they were to stay together at all times. Neither had breakfast that day, but Nelle said, "We certainly made up for it at lunchtime!" The first Sunday they were there, after Sunday school Nelle was stopped by their district leader and asked if she would speak in Sacrament meeting later. She was dumbfounded but remembered, "We do what we're asked to do." She hurried back to their room, wondering what she could speak about. She opened her notebook where she had been recording everything and there was a whole talk she had written for their farewell Sacrament meeting that she had decided not to use, so she had her talk. After one week Nelle and Claudius were tested for their fluency in Spanish; Claudius was given a 5 (out of a possible 5). Nelle was as good as most missionaries get in 2 months, so they discontinued their Spanish classes and concentrated on learning welfare principles, which included teaching others about gardens, soil, etc. They left the LTM on May 25 after only two weeks and traveled to their mission field, stopping in El Paso for last-time visiting with family. Flora gave them a big family dinner. They bought a hearing aid for Claudius and did last-minute shopping. Then they traveled to Dublan to tie up some loose ends in their affairs, do car repairs, give some patriarchal blessings, and pack up all their stuff. They finally left for Villa Hermosa on June 6 with the trunk and backseat of the car packed full and had many adventures, such as getting lost in the slums of Mexico City, getting pulled over by the cops twice (once for smoking exhaust and excessive baggage for which Claudius had to pay 1,500 pesos, the highest "mordida" [bribe] he had ever paid), and once for almost running a red light. They also had the usual car trouble in Veracruz. A worn-out bearing tore a hole in the radiator, and they had to stay all night in the car in a rainstorm waiting for parts. They made it finally to the beautiful little town of Villa Hermosa on Friday, June 9, where they met the mission president. Again on their first Sunday there they were asked to speak in sacrament meeting with a short time to prepare, and Nelle again was horrified and scared but prepared a short message and bore her testimony. They were assigned to labor in Tuxtla Gutierrez, a town in the mountains which had no drinkable water, so they had to buy purified water to use. They were assigned to help teach leadership skills and to find inactive members, "the lost sheep." They worked very hard with the auxiliary presidencies helping them with leadership meetings, training, and going over lists of members and trying to find them to bring them back into activity. To Nelle's delight, one of her favorite former students at Dublan Elementary, Bowen Call, was an elder working nearby. She fixed them a nice meal often when they were there and when Elder Call got sick, Nelle took him into their apartment to care for him until he got better (April 1979). In fact, Nelle would often fix a home cooked meal for any of the missionaries around, which they loved. Other missionaries in their mission from the colonies were Paul Hatch, Dana Call, and Wesley Wagner. One of many highlights of their mission was meeting Elder Howard W. Hunter at a conference in Tapachula and having him recognize Claudius as someone he knew. Claudius reminded Elder Hunter that he had set him apart as a patriarch and had visited him in his office earlier. He remembered Claudius' parents very well and chatted with Nelle and Claudius for a few minutes. There were other brethren who visited and spoke and taught. Another highlight was that Nelle and Claudius were able to attend the very first baptism performed in the Mayan language for a Mayan brother converted by Elder Call and his companion and held in Motul on June 17, 1979. Another enjoyable activity was visiting various ruins in the areas where they served and traveled such as the pyramids at Izapa, the great Mayan temples in Tullum that include the "Temple of the White God," the ruins at Coba and Kohunlich, and ChichenItza where Nelle climbed the stairs to the top of one of the pyramids and the beautiful Loltun caverns. Nelle and Claudius labored also in Merida, working with five branches, one in Valladolid, two in Tizimin, and one each in the beautiful tourist areas of Cancun and the island of Cozumel. They actually lived in Cancun and visited the other branches. To go to Cozumel they had to go by boat, a real "ocean voyage." They even saw dolphins leaping out of the beautiful blue water and following the boat. Later Nelle and Claudius were asked to work in the office on weekdays. Nelle was asked to be the records secretary, even though she had never done anything like that before. She was probably the first and only female records secretary to serve in any mission. She was overwhelmed and nervous about the assignment, but Elder Peterson who was the previous secretary told her, "Don't get discouraged. Spend a lot of time on your knees; you'll catch on." Nelle had many wonderful experiences, such as drinking milk out of a coconut and teaching the sisters had to make banana bread. The first batch one of the sisters made was terrible! Nelle found out later that she had used two cups of vegetable oil instead of one and had used the big cooking bananas. Nelle also made cookies and cinnamon rolls to share, usually with the missionaries. She learned many things, too, including that she didn't like horchata (a rice drink) or cilantro (a spice they put in everything), to take Dramamine before a trip in the boat if the water was rough, to take cold showers or spit baths, to like some kinds of fish like shrimp and breaded barracuda, how to ride on a local bus with standing room only, and to be prepared with some kind of talk because she was called on many times with no time to prepare. She learned that if the chorister was teaching the practice hymn wrong, she and Claudius and the elders could sing really loud and they would start to get it right. She also learned that you can survive not being home with your daughters to welcome a new baby; two grandchildren were born during the mission: Joseph Jensen and Erin Esmeyer. There were other challenges to learn from. Nelle records, "In Cancun we had cars, buses, motos [motorcycles], and drunken neighbors to keep us awake. Here [in Merida] we have cats, dogs, turkeys, trains, and of course, mosquitoes." There was also the heat and humidity to contend with and the worry about children who didn't write letters often enough. But there were wonderful experiences, too, and fulfillment of blessings promised. Many times Nelle and Claudius were protected while traveling in their car. Once they were hit by a drunk driver and had no damage to them or the car. Another time they hit a motorcycle but the damage to it and the driver was minimal. Two months before being released from their mission Nelle started having a toothache. Having no confidence in the dentists there, Claudius gave her a blessing asking the Lord to bless her to take away the pain until they went home and she could get care. She didn't have any more toothaches until after they moved to Salt Lake City and had a good dentist. Both Claudius and Nelle had sickness come to them and through priesthood blessings they were healed almost immediately and were able to continue with their work. From Nelle's journal: "October 17, 1979—Guess what! I fell down! I had on these miserable wood soles and heels shoes and as I opened the front door: kerplunk! I fell on my nose and I mean literally on my nose. My knees had to go someplace so they fell as hard as they could on the hard cement . . . I look like Rudolph the red-nosed reindeer and I feel like I just turned 100 years old. Those shoes have been disposed of 'never to be worn again.' And I feel like my nose is longer than my arms. Moral: never wear wooden heels and toes shoes on hard cement. You'll get plastered every time." Nelle and Claudius were released from their mission in November 1979 by President Martinez because they were stopping on the trip home in Mexico City to see their son Claudius and his family. They had a last opportunity to both speak in sacrament meeting and were given a special luncheon by the mission president and his family with a big cake with 18 candles, representing the 18 months of their mission. After the luncheon there was a special meeting where many people expressed their love and thanks and said many nice things ("much exaggerated, of course" says Nelle). On November 14 they started their journey home and as usual had car trouble, this time it was the "mystery of the heating-up radiator." Even after they had the radiator replaced in Villahermosa, it again heated up and had to be fixed. They finally made it to Mexico City on November 17 where they enjoyed staying with Claudius, Marina, and their children, celebrating Thanksgiving Day and attending the groundbreaking ceremony of the Mexico City Temple where there were over 10,000 saints in attendance. Elder Boyd K. Packer presided. When he lifted the second shovel full of dirt his shovel broke. Luckily they had an extra to quickly hand him so he could continue. While in Mexico City, Nelle and Claudius did some sightseeing and were able to attend a symphony performance at the Palacio de Bellas Artes featuring violinist Itzhak Perlman. Later in 1983 they were able to go back to Mexico City for the temple dedication. They were able to attend the first session with all of Claudius' brothers and sisters seated in the ordinance room next to the celestial room. It was a very special experience. Since they were still having problems with their car, Claudius decided to sell it there, send their stuff home in one of the Wagner's big trucks, and fly home. They were notified of the death of Carlos Taylor (son of Nelle's brother LaSelle) so they flew to Ciudad Juarez so they could attend his funeral in El Paso. They arrived home in Colonia Dublan on December 1st where they stayed in Grandma Bowman's little house since their home was still rented out. They stayed there for two weeks and then traveled to Salt Lake City, Utah, to stay with their daughter Roberta and family and help handle some family problems that their son Conrad was having at the time. Since three of their children and some grandchildren lived in Utah, they decided to buy a home there. After enjoying Christmas with their children, they decided to rent the Clark's home on Winward Drive in the Cottonwood area of Salt Lake City. Nelle was asked to teach in the Relief Society just a few months after they moved in. She did a good job, always using humor and stories to spice up her lessons. They also had their grandson Christopher live with them for a few months so that his parents could solve their problems. Their other grandson Michael was living at the Primary Children's Medical Center and in foster care. In April 1980 these two grandchildren who had been abandoned by their mother were taken away and eventually adopted by a LDS family and were not seen by the family again. The next few years were spent working in the Church (Nelle was a Relief Society teacher), enjoying children and grandchildren, and going to all their programs, recitals, games, etc. They also help out by babysitting and welcoming new grandchildren; there were quite a few. Nelle was quite a poet. She enjoyed writing poems especially for her grandchildren for their birthdays and special events. In the spring of 1981 Nelle and Claudius did some traveling. They went to visit Claudius' brother Bob and his wife Rickie in Dixon, Illinois. They all visited the Church historical sites in Carthage and Nauvoo and traveled to Washington D.C. where they went to concerts, museums, the botanical gardens, and the Library of Congress. It was one of the happiest experiences of their lives. Claudius and Nelle had wanted to buy a home in Utah, so they decided to sell their home in Mexico to Ron Taylor in order to finance a home in Salt Lake. They found a nice little house on Olive Drive, just a block from Claudius' sister Dorothy. They bought the house on February 16, 1982, and moved in a few days later. They attended the Winder 6th Ward where they made special friends and had great experiences. Nelle and Claudius took many trips: to the colonies, to Arizona to visit their daughter Nina, and to attend Lunt-Taylor family reunions. Another great trip was in April and May of 1982 when they went to the World's Fair in Knoxville, Tennessee, the first they had ever seen. They also visited New Orleans, took a paddle-boat trip on the Mississippi River, visited Key West, Florida, and spent a day at Disney World. They traveled with a group of senior citizens including their dear friends Elbert and Ella Miller, so there was never a dull moment. In August 1983 Nelle had quite an ordeal—she had to have a hysterectomy and hernia repair operation. She came through well but stayed in the hospital for 7 days. On the first night home, she developed a high fever and was in a lot of pain so the doctor suggested she go back to the hospital. She had an infection and had to stay in the hospital for another 7 days. During this time she had many visitors, calls, and cards but was glad to get home. A few days later she developed a rash that was very itchy. She said, "I felt like I had the 7 year itch but was 10 years behind in scratching!" As soon as she quit taking a certain medication, the rash went away. In September of 1984 Nelle had total knee replacement surgery on her right knee. She had been suffering for a long time with pain in that knee. She came through the surgery very well and was up and around, on crutches in no time. Later in May 1990 she had to have the same knee replaced again. In May 1985 Claudius and Nelle traveled to the colonies to attend the Academia Juarez High school graduation. The special thing about this graduation was that many of the students graduating had been Nelle's students in kindergarten about 18 years before. Four of the graduates told Nelle that she had been their favorite teacher. Nelle also enjoyed celebrating her class of 1935 high school reunion. They had a party and dinner at the home of Nelle's best friend in high school, Nellie Spilsbury Romney. Fifteen of the thirty-three graduates were there. During the giving of awards, Nelle got an award (a set of ear plugs) for making people laugh. Another outstanding experience was the Centennial Celebration of the Mormon Colonies in Mexico in August 1985. There was a week of activities, including a pageant, barbecue, parade (the Bowman family built a float), a talent program, dance, and a chuck-wagon breakfast. It was a wonderful experience with many people coming "home" to celebrate together. About this time Claudius began having problems. First he lost his singing voice, then he began having problems eating and swallowing. They went to many doctors and had many tests, but it wasn't until the middle of 1987 when Claudius was beginning to be weak and tired and his voice was affected that the doctor diagnosed Lou Gehrig's disease, amyotrophic lateral sclerosis. This changed their lives considerably over the next year and a half as Claudius became weaker and weaker with his muscles losing their function. Nelle spent most of her time caring for him. She wrote, "It was a blessing for me to take care of him. He was no trouble at all; never complained. He said to me many times, 'I don't want to be a burden to you'. And I would reply with, 'You are not a burden to me; you are too skinny! (114 lbs).'" Claudius passed away on January 10, 1989, in his sleep. He had insisted that he wouldn't have a permanent feeding tube put in, which was scheduled for that day. Now Nelle had to adjust to being alone; she very much missed taking care of her sweet husband. (Actually, Conrad lived in the basement but he was gone so much working that it was like being alone most of the time.) She wrote, "My sweetheart has been gone three months; it seems like three years. I get so lonesome sometimes I can hardly stand it. The good memories we had together and the fact that he is not suffering any more keep me going." In August 1992 Nelle's son, Claudius, moved in with her, living in her basement. This was a very big help to her to have someone who could do some of the work around the house and to have someone to talk to. He lived there for almost 10 years taking care of Nelle, especially during the years her health began to deteriorate. She continued to have back pain, knee problems, and early stages of dementia. But for the most part she was a joy to be with; she never lost her sense of humor or her enjoyment of eating out and visiting with people. In August 2001 because of health problems, Nelle moved in with her daughter Roberta's large family in West Valley City, Utah. They remodeled their home to fix a room and bathroom for her. There she enjoyed the numerous family activities and getting to know some of her grandchildren and hardly ever complained about the noise or the food. They learned that Grandma was always ready to go out to lunch or dinner at the slightest suggestion. They also enjoyed listening to her stories and experiences and many times Grandma would have the little kids laughing hysterically as they sat around the dinner table listening to her jokes and funny stories.